Further excavation is required to clarify this unusual feature. 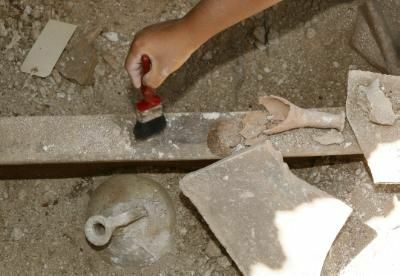 The archaeological excavation site of Prastio - Mesorotsos, in Pafos district, has revealed ancient remains from the Neolithic, Chalcolithic, Early and Middle Bronze Age as well as the Late Roman and Medieval periods, which show an increase in architectural sophistication. A Department of Antiquities press release notes that the site “is situated around a prominent rocky outcrop in the Dhiarizos Valley and commands dramatic views to both the mountains and the sea. Its location in the valley and easy access to abundant natural resources probably had a great deal to do with the site’s extraordinary longevity”. In the project’s sixth season, the team «excavated in four areas of the site, exposing ancient remains from the Neolithic, Chalcolithic, Early and Middle Bronze Age as well as the Late Roman and Medieval periods”, the press release continues. The Neolithic trenches revealed a series of occupation levels with domestic structures and activity areas creating a sequence beginning in the Aceramic Neolithic and continuing into the Early Chalcolithic period. Another trench, the press release adds, “has a remarkable Bronze Age stratigraphic sequence starting from the Early Cypriot I-II with a series of curvilinear structures built on simple terrace”. “The architectural evidence shows that inhabitants of this ancient rural village changed architectural styles, introduced a new type of pottery and began to rapidly increase in social complexity from the start of the Middle Cypriot until the abandonment of the site before the onset of the Late Cypriot Bronze Age”, the press release points out. This increase in sophistication of architecture, it is added, “culminated in the construction of a large (1.5m wide) free-standing wall separating one terrace level from another, probably connected by a curving ramp or stair that was blocked up at a late stage”. On top of the rocky outcrop, remains from the Late Roman, Byzantine and Frankish periods have been found and in 2013 a trench was opened on the highest point to investigate architecture relating to these periods. In this trench a well-built building orientated to the cardinal directions was discovered, with artifacts found in place on the floor. This is likely not a simple chapel, as there are abundant artifacts of domestic nature indicating longer-term inhabitation. The press release continues to note that “it is likely that this building, perhaps a hermitage or ecclesiastical residence of some sort, collapsed suddenly at some point in the 13th or 14th century, at which point this location was abandoned”. At the same time it is pointed out “the climb to the top of the rock today is treacherous and can be presumed to have been so in the past, creating an isolated but nevertheless prominent and highly visible presence”. The excavations were conducted from July 11 to August 11 2013. The team is led by Dr. Andrew McCarthy, Fellow of the School of History, Classics and Archaeology at the University of Edinburgh and Director of the Cyprus American Archaeological Research Institute (CAARI). The project involves the cooperation of an international team of specialists and field school students.